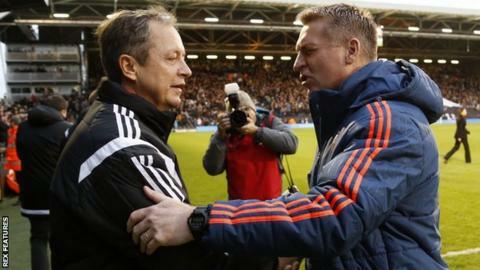 Fulham and Brentford drew an exciting west London derby at Craven Cottage. The hosts fell behind to Alan Judge's penalty in Stuart Gray's first game in caretaker charge after Ashley Richards fouled Jake Bidwell. Brentford defender James Tarkowski headed into his own net to make it 1-1 and Fulham led midway through the second half when Ross McCormack set up strike partner Moussa Dembele. Jack O'Connell earned a point for the Bees, turning in Tarkowski's flick-on. Gray, who was appointed as senior coach by Fulham on Tuesday, could not halt his side's winless run, now stretching back six games. They lie 17th in the table, while Brentford missed the opportunity to move into the play-off spots despite results elsewhere going in their favour. They made an encouraging start in Dean Smith's second game as boss, with Nico Yennaris and Lasse Vibe going close to scoring either side of Judge's successful spot-kick. But McCormack was a constant threat for the home side, putting in the cross for Tarkowski to head past his own goalkeeper as well as creating Dembele's goal with an astute pass. And after O'Connell levelled the scores, he almost won it for Fulham with a free-kick from the edge of the box which forced Button to a good save. "In the past the heads have dropped when going 1-0 down, but the team didn't do that today and got back into the game. "Then to get our noses in front I think we were going to go on and win it. But our Achilles heel has been defending corners so we've been done on two set-plays. "We were playing a side full of confidence - obviously they've got a new manager and they probably started a bit brighter than us." "The pleasing thing today was how strong the bench was, when you have got players who can make an impact. "It was a very entertaining game, I thought it was pretty even first half, we started the second half brightly and passed it really well. "They scored against the run of play, but the lads showed great character. A point was a fair result as they finished the game stronger." Match ends, Fulham 2, Brentford 2. Second Half ends, Fulham 2, Brentford 2. Foul by Matt Smith (Fulham). Jack O'Connell (Brentford) wins a free kick in the defensive half. Offside, Brentford. James Tarkowski tries a through ball, but Philipp Hofmann is caught offside. Corner, Fulham. Conceded by Nico Yennaris. Attempt missed. Matt Smith (Fulham) header from the centre of the box misses to the left. Assisted by Jamie O'Hara with a cross following a corner. Attempt blocked. Alexander Kacaniklic (Fulham) right footed shot from the centre of the box is blocked. Attempt blocked. Moussa Dembele (Fulham) header from the centre of the box is blocked. Assisted by Jamie O'Hara with a cross. Attempt blocked. Moussa Dembele (Fulham) right footed shot from the centre of the box is blocked. Assisted by Luke Garbutt with a cross. Foul by Jazz Richards (Fulham). Substitution, Fulham. Cauley Woodrow replaces Ryan Fredericks. Substitution, Fulham. Alexander Kacaniklic replaces Scott Parker. Attempt missed. Jack O'Connell (Brentford) header from the centre of the box misses to the left. Assisted by Jake Bidwell with a cross following a corner. Corner, Brentford. Conceded by Moussa Dembele. Attempt saved. Ross McCormack (Fulham) right footed shot from outside the box is saved in the centre of the goal. Offside, Brentford. John Swift tries a through ball, but Jota is caught offside. Attempt blocked. John Swift (Brentford) left footed shot from the left side of the box is blocked. Assisted by Alan Judge. Goal! Fulham 2, Brentford 2. Jack O'Connell (Brentford) header from very close range to the top left corner. Assisted by James Tarkowski with a headed pass following a corner. Corner, Brentford. Conceded by Luke Garbutt. Substitution, Brentford. Jota replaces Sergi Canos. Substitution, Brentford. John Swift replaces Konstantin Kerschbaumer. Goal! Fulham 2, Brentford 1. Moussa Dembele (Fulham) right footed shot from the centre of the box to the bottom right corner. Assisted by Ross McCormack. Corner, Brentford. Conceded by Andy Lonergan. Attempt saved. Lasse Vibe (Brentford) right footed shot from the left side of the box is saved in the bottom right corner. Assisted by Konstantin Kerschbaumer. Offside, Fulham. Tom Cairney tries a through ball, but Ross McCormack is caught offside. Attempt blocked. Moussa Dembele (Fulham) right footed shot from the left side of the box is blocked. Assisted by Richard Stearman.